To increase speed, most painting companies spray as much of the exterior paint as they can. ELEGANT ntNTING® is one of the very few painting companies in the Puget sound area to follow instructions provided by siding manufacturers and back-roll the entire siding. Back-rolling(or back-brushing) is the original and accurate application method and also recommended by all exterior coating manufacturers. The first image shows the quality of work you would expect from 90% of painting companies on the eastside. 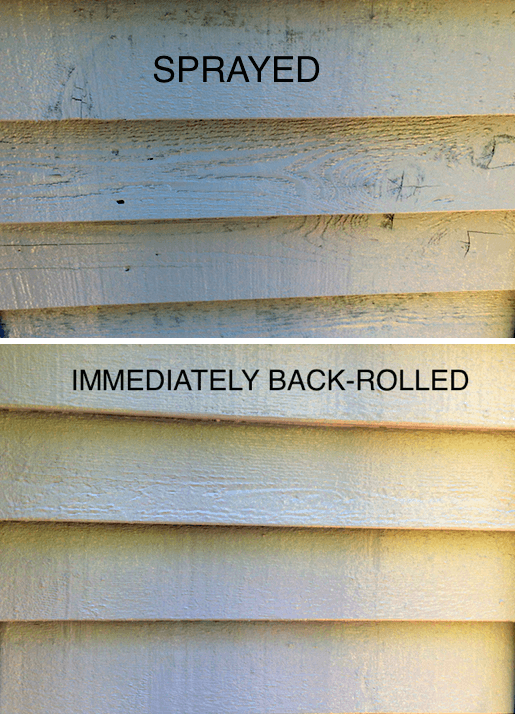 The same siding was painted in the second image following manufacturer’s recommended application method. 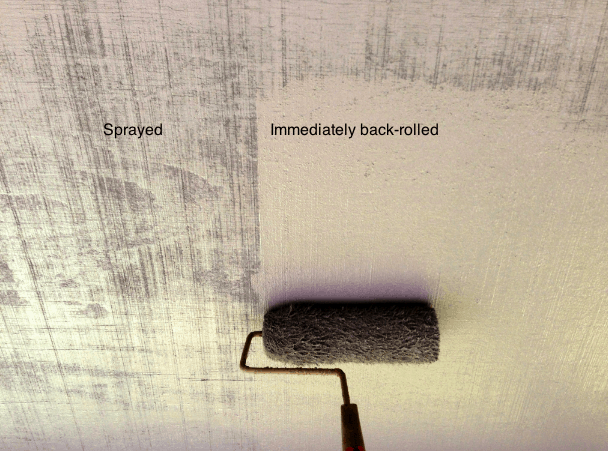 Why is back-brushing paint necessary? Spray machines lay the paint on top of the surface, allowing the coat to dry and trap millions of microscopic air pockets underneath. As paint ages, the resin oils that bond the pigments together begin to weaken. On a hot sunny day, the trapped air expands and causes the premature failure of the entire paint job in the form of bubbles, cracks, peeling, and chipping. Back-rolling increases adhesion by forcing the paint into the grain, pushing out all the air that would otherwise be trapped in the texture. This method adds an additional 4-5 years to the life of our already durable paint job. With High-nap rollers and the proper amount of pressure, we are able to push all trapped air out of the grain, forcing the material to fill the texture and bond with the siding. No. While some painting companies claim to achieve the same cosmetic effect with a sprayer, back-rolled coats will always have superior durability. Paint that has been rubbed on the surface will always have better adhesion compared to the material that has simply been blown at the surface with a spray machine. 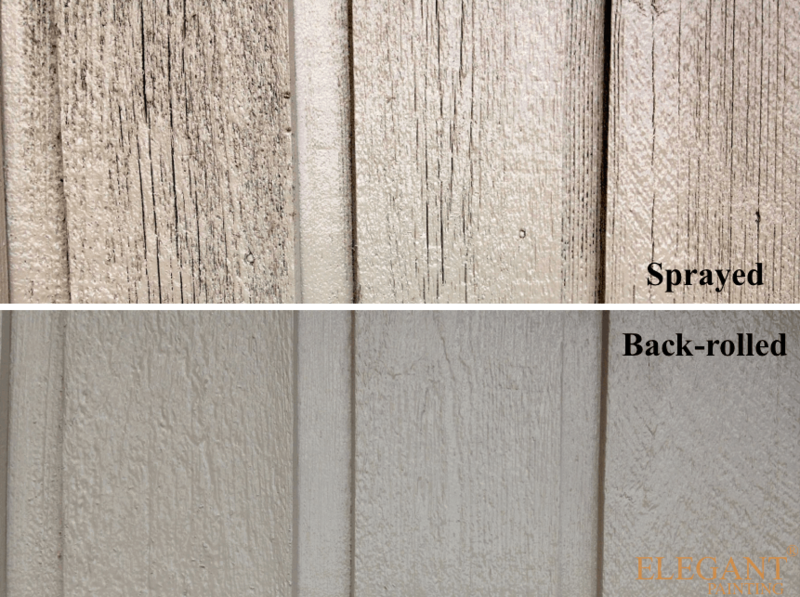 ELEGANT PAINTING is one of the very few painting companies in the Puget sound area to back-roll the entire siding. 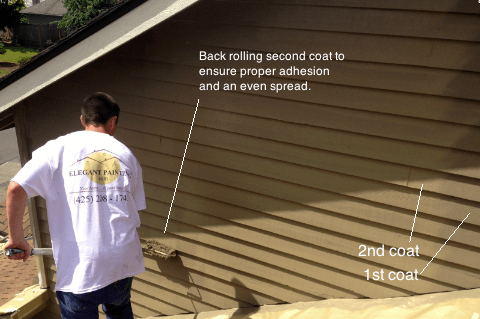 While other companies use sprayers to get the job done quicker, Back-rolling (or back-brushing) the siding is the most efficient application method recommended by all exterior paint manufacturers. Spray machines lay the paint on top of the surface, allowing the coat to dry and trap millions of microscopic air pockets underneath. As paint ages, the resin oils that bond the pigments together begin to weaken. When exposed to high temperatures, the trapped air expands and causes the premature failure of the entire paint job in the form of bubbles, cracks, peeling, and chipping. Back-rolling increases adhesion by forcing the paint into the grain and pushing out the air that would otherwise be trapped in the texture. This method adds an additional 4-5 years to the life of our already durable paint job. While some painting companies claim to achieve the same cosmetic effect with a sprayer, back-rolled coats will always have superior durability. Paint that has been rubbed on the surface will always have better adhesion compared to the material that has simply been blown at the surface with a spray machine. We use spray machines to deliver the paint from the bucket to the siding, while a roller spreads the material and works it into the grain. The sprayer is simply there to prevent the roller from having to be dipped in the bucket every few seconds. We also use premium fine finish sprayers on front doors and interior trim.